All-terrain vehicle riders Sheldon Sarsuelo, right, and Ikaika Kuahiwinui took a moment's rest yesterday on the muddy 11-mile ATV and dirt bike trail in the upper Waiakea area near Hilo. Both emphasized the importance of safety. HILO » Three people have been killed riding all-terrain vehicles on the Big Island over four weeks, leading to renewed concern about their safety. » Wear a helmet, eye protection, shoes and protective clothing. » Never ride on paved surfaces or public roads. » Never engage in stunt riding. » Avoid excessive speeds and be careful on difficult terrain. » Take approved ATV safety education training. » Don't let children ride full-sized ATVs, and follow age recommendations for models. » Follow all safety recommendations of the ATV manufacturer. » Operate ATVs only during daylight. » For more information, see www.etonamerica.com/EA_Safety.htm#Tips and www.atvsafety.org. Police have warned riders that ATVs are illegal on streets, even on private subdivision roads, and will be ticketed and even confiscated. But ATV sales have been booming while owners have limited places to ride. "They should have more county and state tracks and ATV parks," said Hilo rider Jeremy Yadao. » Paul David Youngs, 20, of Paradise Park died last Saturday at the Queen's Medical Center after hitting a rock wall on a private, unpaved subdivision street in Hawaiian Paradise Park south of Hilo on Nov. 15. Youngs was speeding and not wearing a helmet, police said. » Ralph P. Schipa Jr., 64, of Honokaa was riding up his gravel driveway Nov. 16 when he ran off his driveway and hit a tree stump. Police did not say whether speeding or helmet use were factors. » Jeanne Moriguchi, 44, of Captain Cook was riding downhill on her driveway Oct. 22 when she lost control and hit a tree. She was not wearing a helmet, police said. Designed as slow farm vehicles, ATVs become a problem at high speeds, police Sgt. Dexter Veriato said. "They flip over really fast," he said. 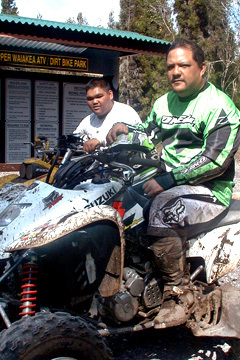 Ikaika Kuahiwinui of Pahoa and Sheldon Sarsuelo of Hilo, resting for a moment in the state's Upper Waiakea ATV/Dirt Bike Park, explained how it happens. The front end hits an object and stops, the back end flips up and the rider goes flying head first, they said. They noted that at least two of the three recent deaths involved people not using helmets. Protective gear is a necessity, they said. That includes the helmet, protective clothing, boots and even body armor. Both four-year veteran riders, Kuahiwinui and Sarsuelo took off their helmets to talk yesterday, then put them back on just to ride another 100 feet to the back of a pickup truck. Eye protection is also vital when riding muddy, overland trails. "You close up your eye for one split second and it's over," Kuahiwinui said. Although similar in appearance to motorcycles, ATVs handle differently. A motorcycle is more maneuverable because the rider only has to watch one front wheel, Veriato said. "You can pretty much pick your path," he said. With two front wheels, the rider has to watch both sides to avoid getting hung up on something like a rock. A major difference from a motorcycle is the throttle, Kuahiwinui said. On a motorcycle, the throttle is the grip on the right handlebar, operated by twisting. On an ATV the throttle is a small lever on the handlebar, operated with thumb pressure. That means if an ATV hits a rock and jolts the hand, the thumb might give a sudden burst of gas, increasing speed at the worst moment. Yadao said riding on streets can be more dangerous than cross-country because higher speeds are possible. If one of the wheels catches on the edge of the street, the ATV quickly flips over, he said. Someone riding with a friend on the back of a motorcycle is a familiar picture. That is banned with ATVs. Every ATV comes with a warning on the frame not to carry passengers because that throws off the center of gravity, said David Makizuru, acting manager of Cycle Sports Hawaii. These are warnings that many riders do not know because they are first-time ATV buyers. Sales have double "in recent years," Makizuru said. Kuahiwinui said they have "doubled big time" in just two or three years. Last year, the state Department of Land and Natural Resources opened an 11-mile ATV and dirt-bike trail though the upper Waiakea Timber Management Area of non-native trees. A private group is building a track for children riding ATVs on one acre near Hawaii County's drag strip in Hilo, and another group is planning a track for children on Parker Ranch land near the west end of Saddle Road. Although smaller ATVs are built for children, county paramedic Bill Bergin said he has seen many injuries even with children wearing protective gear because small children cannot handle the weight of the vehicle. Makizuru complained, "I see a lot of kid's parents let them do anything they want" with ATVs. Veriato said police have no statistics on nonfatal ATV injuries because the vehicles are not registered.